The power of Pentagon2000 right in your hand. 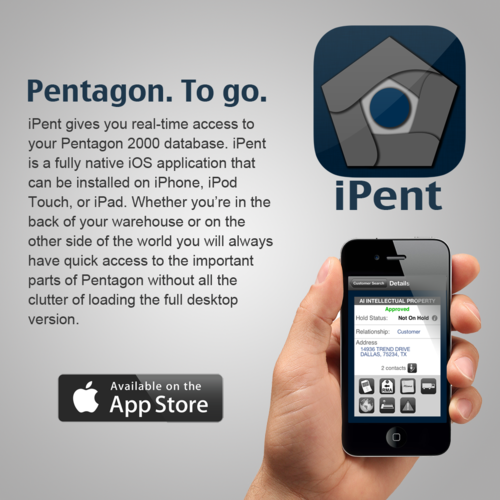 iPent is a native iPhone/iPad application which connects seemlessly to your Pentagon2000 backend giving you access to the office even when you are away. PN Import Export is excited to strengthen our partnership with Braumiller Law Group, a global leader in the trade compliance industry. AIIP is excited to announce the release of iPent version 2.0.8! With it comes loads of new features and enhancements requested by our customers. Stay tuned for even more features coming later this month. Interested in seeing a live demo of iPent? Find Mike Dunst at NBAA or the MARPA conference October 21-25 in Las Vegas.